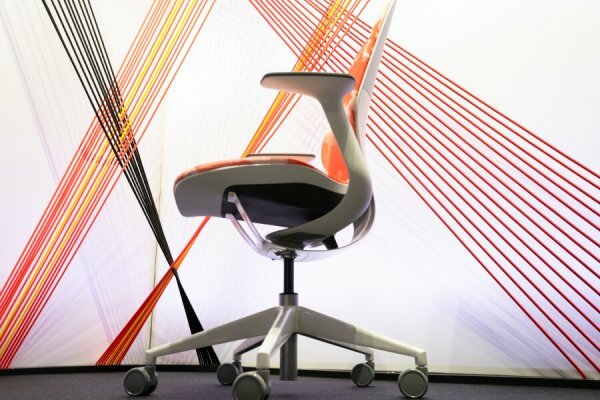 It’s only fitting that the chair which serves as the focal point of the Steelcase exhibit space at TED2018 was inspired, in part, by a TED Talk. Back at TED2009, Steelcase VP of Global Design and Product Engineering James Ludwig saw athlete and Paralympian Aimee Mullins speak about her different prostheses (TED Talk: My 12 pairs of legs). He was especially intrigued by her carbon-fiber “cheetah feet” and how they could store and release energy. He wondered: Could this wondrously light yet stiff yet flexible material — revolutionizing airplane, car and bicycle manufacturing — be used in a desk chair? Carbon fiber hadn’t been used in mainstream furniture, but Ludwig was also bent on following a vision he’d had the previous year. The standard high-tech office chair had become what he calls “an exquisite machine” — consisting of up to 250 parts — but he’d tired of these contraptions. “I didn’t want to feel like I was sitting on a mechanical bull,” says Ludwig (can we get an amen?). He wanted to make a chair that was far simpler, so he sketched one that sat on “four leaf-like tendrils.” He had no idea how he’d build it, but that’s the task of industrial designers: envisioning what doesn’t exist — and then making it happen. Mullins’s feet lingered in his mind, and he thought back to his dream seating and realized he might have found a solution. His next step was to see if a chair could even been made from carbon fiber. The result, which took him and his team several years to design and execute, was the LessThanFive, named because it weighs less than five pounds. The game was on. In the Steelcase Innovation Center in Grand Rapids, Michigan, Ludwig found a corner space, papered the windows, gathered a handful of colleagues, and set to realizing the chair that he’d seen only in his mind. Six months later, he had a prototype. It was everything he wanted — responsive and streamlined — except for its price: it would be prohibitively expensive to produce. “Carbon fiber is a handicraft; it needs to be finished by hand,” explains Ludwig. He told his engineers that they needed to figure out how to do it more cheaply. After some grumbling and sighing, they returned to work and created what Ludwig evasively refers to as a “proprietary fiber and material composition” — in other words, a patent-pending substance that was made from a high-performance polymer. Upholstery, molding and operations teams were called in, and 18 months later, Ludwig’s creation was released in January 2018: the SILQ chair. He had a lofty mission: “I wanted it to look like Isamu Noguchi had an aerospace degree.” And with its soft curves and sculptural lines, it kind of does. It also drastically reduced the number of parts: just 30. The special polymer replaced many of the springs and hinges that provide flex and support in the typical desk chair. And in a welcome development to anyone who’s hit the wrong switch and made their chair plummet ridiculously during a meeting, it has only one lever that raises and lowers the seat. But how does it feel? Well, when I sat in the SILQ, it felt like it was made for someone my size. In some sort of industrial-design wizardry, the back cradled my lower back and my head in the right spots — it was the opposite experience of sitting in an airplane seat where I always feel like I’m wearing someone else’s shoes. “This is a once-in-a-decade chair,” pronounces Ludwig.”It’s intuitive and material-based.” Maybe so, but to me, it was something much more special: comfortable.